This blog was originally posted on July 24, 2013, but I updated it with a couple recipe tweaks as well as some new photography. Enjoy! It’s been a hot one in Boise this summer. Days upon days of triple digit heat and as much as I love to cook, that love is trumped by the desire to keep the house, and myself, as cool as possible. This means lots of cold fruit, crisp salads and anything that can be grilled (which is more than you might initially think). Last blog I wrote about the dilemma of summer picnics and my goal to not show up with a dish someone else might have also brought (think potato salad), so I’m always on the lookout for interesting and unique recipes. 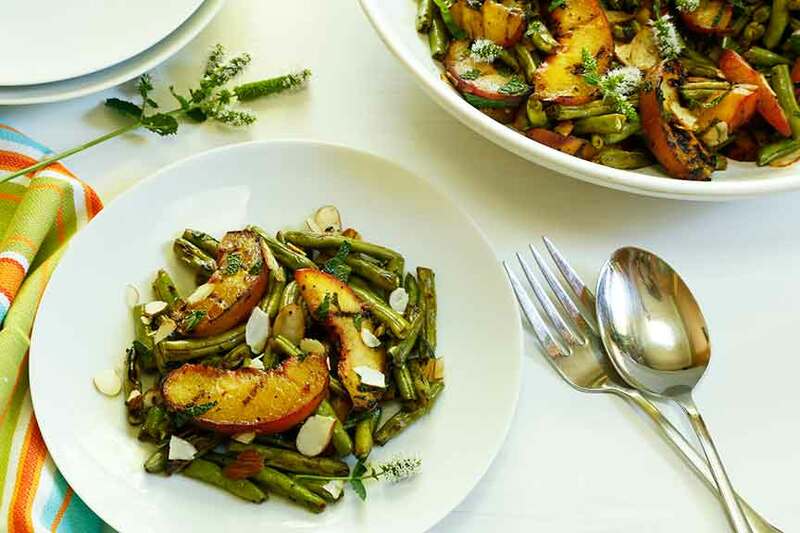 When I ran across a pairing in Bon Appetit for grilled green beans and peaches I knew my criteria had been met. Toss peaches with 2 Tbsp of the olive oil, salt and pepper. Either place in a grilling basket sprayed with nonstick spray, skewer or carefully grill the slices directly on the grate. Mix the green beans with the remaining 2 Tbsp of olive oil and seasoning with salt and pepper. 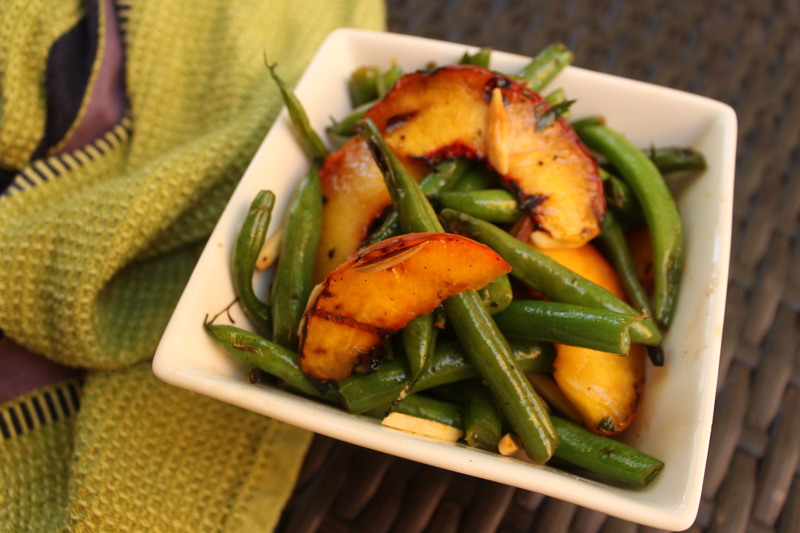 Place in grill basket over high heat, turning and stirring often, until beans are crisp-tender and peaches are lightly charred, about 8 to 10 minutes. Remove from the heat, combine in a big bowl with lemon juice, mint, red pepper and almonds (and maybe just a light drizzle of some really great olive oil if you’re so inclined). Check the seasoning and add more salt & pepper if needed. 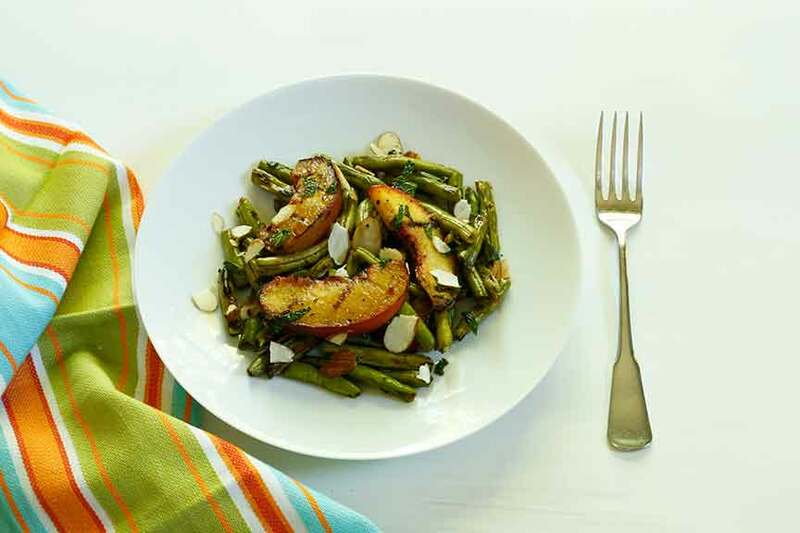 The dish was bright and colorful with fresh-from-summer taste. And you can bet, there wasn’t another like it at the picnic!